Russia boasts many towns and cities named in honor of famous historical figures; but only one city bears the actual name of a person: Vladimir. Located 80 miles northeast of Moscow, it marks the start of the Golden Ring tourist route. The road from Moscow to Vladimir is good, and the drive is only two hours by car. Enter the city without turning and you will be exactly where you want to be: in the historic district. Of most historical significance is, naturally, Vladimir's Kremlin. Unlike its more famous namesake in Moscow or kremlins in other cities, Vladimir's Kremlin is not a complex of buildings enclosed by walls ‒ it makes up an entire region of the city, extending from the Golden Gate to Rozhdestvensky (Christmas) Monastery. The Vladimir Kremlin also forms part of Bolshoya Moskovskaya Street, which consists mostly of historic buildings. Bolshoya Moskovskaya has been a commercial street since medieval times, and today the first floors of the buildings are composed entirely of shops and cafes. If you come to Vladimir by car, your best bet is to start your sightseeing tour with the Golden Gate. The Golden Gate is listed as a world heritage site by UNESCO, having been built by Prince Andrei Bogolyubsky in 1164. In those days, Vladimir was surrounded by a protective wall and a moat. To enter the city, visitors had to pass through several gates, the grandest of which was the Golden Gate pointing in the direction of Moscow. In appearance it resembles a large church with a passageway down the center. The shrine was built to provide not only physical but also heavenly protection. Unfortunately, the other gates did not survive; but there remains a small part of a protective rampart to the right of the Golden Gate that nowadays can be mistaken for a hill. It is possible to climb it via the stairs or, if you prefer something a bit more extreme, the rather precarious path. Nearby stand Trinity Church and the Museum of Crystal. Entrance to the museum costs only 50 rubles ($1.50). Walk along the rampart away from the Golden Gate, and an interesting structure meets your eyes. There is an old water tower made of red brick, built in 1912. No longer used for its intended purpose, it now houses the "Old Vladimir" museum exhibit. A variety of interiors from the last century has been recreated inside the museum: merchant stall, police station, tavern, etc. It is certainly worth a look. Where to stay: Tired souls are never short of a bed in Vladimir. The historical center and suburbs are bustling with hotels, hostels, and tourist bases. The prices are reasonable, from $13 per day. How to get there: The Moscow-Vladimir train departs daily at 7:24 a.m. from Kursk station; the 118-mile journey takes 2 hours 30 minutes. Express buses also run this route (Bus № 115). If you come to Vladimir on a tourist bus, more likely than not you will find yourself right on Cathedral Square. Everything here is of interest. In the center of the square stands a Soviet-era monument in honor of the city's 850th anniversary. This massive structure, depicting an ancient warrior, an architect, and a modern worker, is nicknamed the "three fools" or "three loafers" by the locals ‒ probably because the figures are all in a sedentary position. Cathedral Square was named in honor of the Uspensky and Dmitrevsky cathedrals, which define the city's outer appearance. The larger of the two, Uspensky, adorns most postcards bearing views of Vladimir. It is the city's calling card, without a doubt. The cathedral stands at the highest point of the city, and its most prized asset is the observation deck behind it. The view from here is dizzying. Below, the Klyazma River winds its way through the endless expanse of fields and forests. To the right, the old part of the city looms large on the southern slope, the houses descending down to the river like steps. If you want to see real historical color untouched by restoration teams, take a stroll through the streets of this part of the city on the southern slope. Here you will catch sight of the old pharmacy, the old bridge, and the "end" churches ‒ so called because they were built at the end of each street. There is no gloss to pull in the tourists; it is not a postcard, but a true depiction. The southern slope displays a genuine, pristine beauty. The epicenter of "Legendary History"
Tour guide Olga is driving a cart full of tourists around Uspensky Cathedral. She talks passionately about her city and all the places of interest in Vladimir: "Besides the main tourist sites, you can walk along the edge of the rampart by Rozhdensky Monastery. The streets on the other side, parallel to Bolshoya Moskovskaya, are fascinating. They also contain the remains of ancient fortresses and very many historical buildings, although they are not as well kept as in the center. I also highly recommend Nikitskaya Church. It's the only example of Baroque architecture in Vladimir Region." A common form of punishment used to be exile and hard labor in Siberia. The purpose of this was to remove criminals from the cultural and economic center and, at the same time, to develop the vast expanses of Russia's hinterland. Convicts shackled in irons set off on foot along Vladimir Highway. The route passed directly through the center of Vladimir. Today's Bolshoya Moskovskaya is nothing other than a part of that "Vladimirka in chains," as prisoners used to call it. Historically, Vladimir was a market town, since it was a trade route on the way to Nizhny Novgorod. Now the route is not as vital as it was long ago, so the area is no more commercial than any other regional center of Russia. Today, Vladimir is quite an industrial city. There are tractor plants, metal works, food factories, light industry, and much more. The city's population is around 350,000. Vladimir is the administrative center of Vladimir Region. Despite all the industry, the city is still remarkably green and home to many parks. At the foot of the hill on which it stands flows the Klyazma River. It is not the Volga, of course, but you can still swim here if you want. In any case, the river has several beaches where residents come to relax in the hot summer. 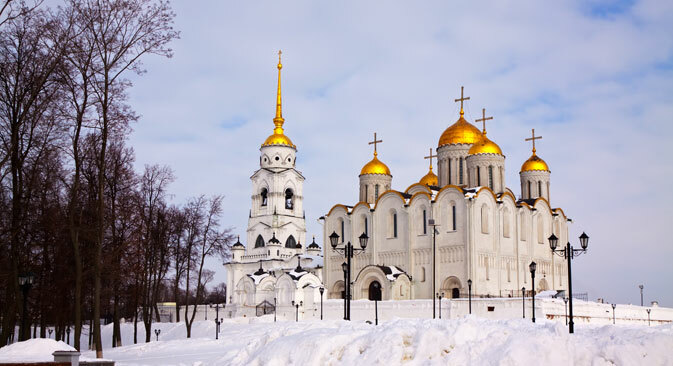 Lovers of art and photography go to Vladimir for the magnificent views of unspoiled Russian nature. A camera here is unnecessary ‒ Vladimir leaves plenty of indelible impressions in the mind, enough to last a lifetime.